A filling, budget-friendly recipe that will feed four generously – what’s not to like about this salmon recipe? Preheat the oven to 180°C/fan160°C/gas 4. Bring a pan of salted water to the boil, then simmer the potatoes for 2-3 minutes. Drain and set aside. Heat the olive oil in a frying pan and gently fry the red onion for 5 minutes, then stir in the flour and season well. Wilt the spinach in a pan over a medium heat, then squeeze out the excess liquid. 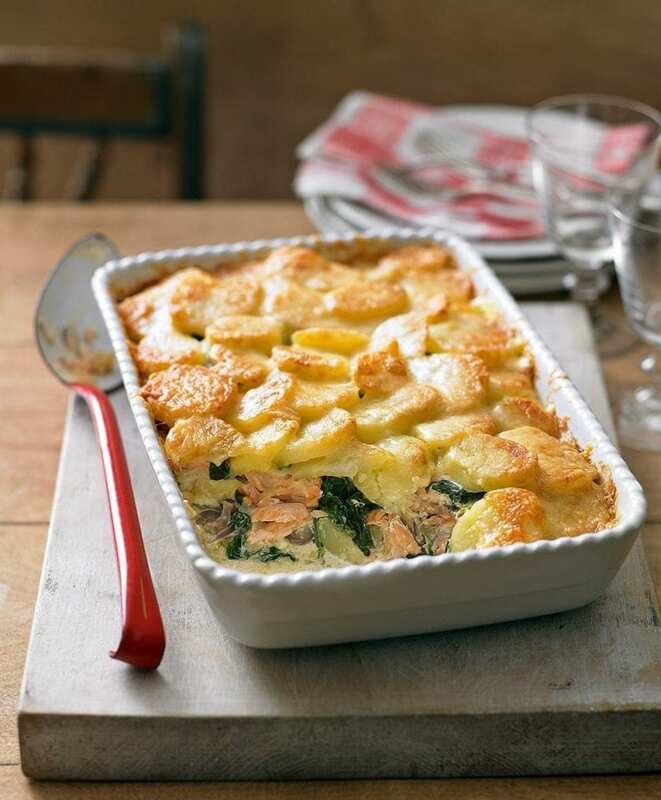 Butter a 1.2-litre ovenproof dish and layer up the potatoes and onion with the salmon and the spinach, ending with a layer of potato. Pour the cream over the top. Sprinkle with the Gruyère and bake for 20-30 minutes, until golden and bubbling. What's the perfect wine match? Our friends at Majestic Wine recommend Davils Creek Sauvignon Blanc. Bursting with passionfruit and gooseberry, this is a classic representation of why New Zealand Sauvignon is so loved. Salmon’s strong flavour stands up to the intense fruit of this wine. Use promo code DELICIOUS at checkout to get £10 off when you spend £40 or more.